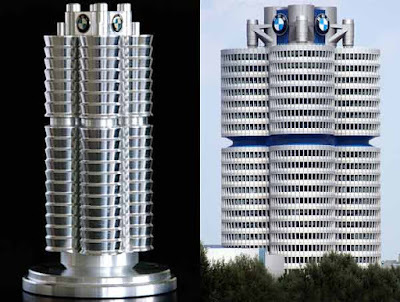 This metal souvenir building model of the BMW high tower head quarters building located in Munich, Germany has the four BMW emblems at the top and measures 7" high. Expertly made from machined steel, the BMW souvenir building is produced by Werner, the person selling it from Germany via eBay. The real building, officially called the BMW-Verwaltungsgebäude (administrative building), was designed by the Viennese architect Karl Schwarzer. Designed to represent a four-cylinder engine, The main tower consists of four vertical cylinders which do not stand on the ground, but they are suspended on a central support tower. During the construction, individual floors were assembled on the ground and then elevated. The 331-foot-tall building was completed in 1972, just before the summer Olympics. The Munich landmark has served as the world headquarters for the Bavarian automaker for over 30 years and was declared historical in 1999. The building has 22 occupied floors, two of which are basements and 18 serve as office space. The Bavarian Motor Works company was founded in 1913 and started building airplane engines in 1917. In 1923, BMW began building motorbikes and eventually, in 1928, they produced cars. The BMW Museum, which is the bowl-shaped structure located right next to the tower, exhibits a car collection, concept cars and history of the BMW brand.